The Lost is stories of hope, tragedy, and the people the world turns away from. From a young woman struggling with addiction to a streetwise Santa looking out for his friends, these stories range from literary to magical realism. The Lost is an anthology of stories that confront issues of homelessness and the people our society ignores. The Lost features a great group of writers who have created daring, elegant stories of loss, redemption, and love. The Lost is a fiction anthology with nine stories about the lives of the people society has forgotten. 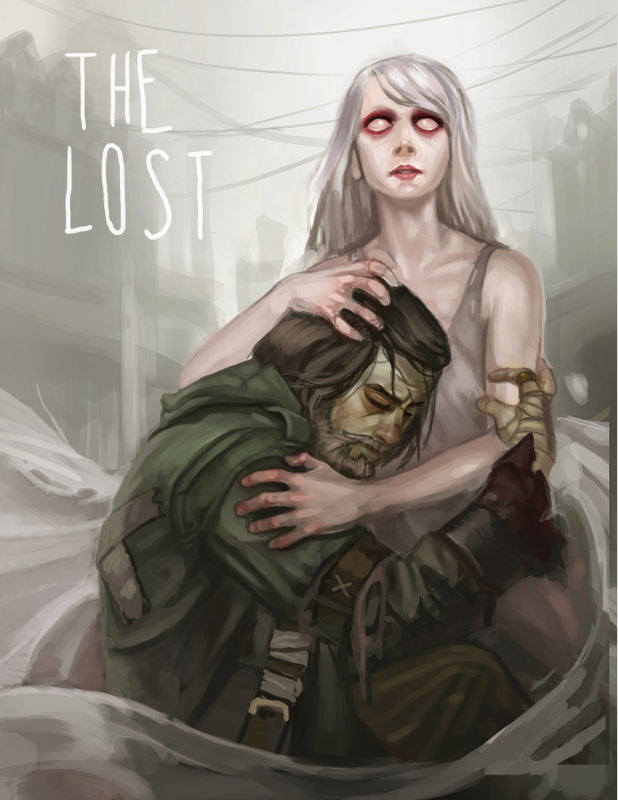 The proceeds from The Lost will benefit City Harvest, a charity that feeds the hungry. Part of the reason that this charity is near and dear to me is because I've been homeless, and I know how you can feel close to that edge again (having been underemployed for a while now) , so I know that the time comes when you need to get help. I've never been one to easily ask for money, unlike some who seem to think it is OK to ask others to pay for things in life like moving expenses or car repairs. Homelessness are people who are in genuine need and who need genuine help, and people like +J.R. Blackwell and +Brennan Taylor of Galileo Games wanting to help warms my heart. For $5 you can receive one of the short stories in electronic form. For $10 you can receive the anthology in electronic form. Obviously, you can give more, help more. and that would be a great thing. Never ever give because someone says that you need to, or because you feel that you have to...give because it is the right thing to do. 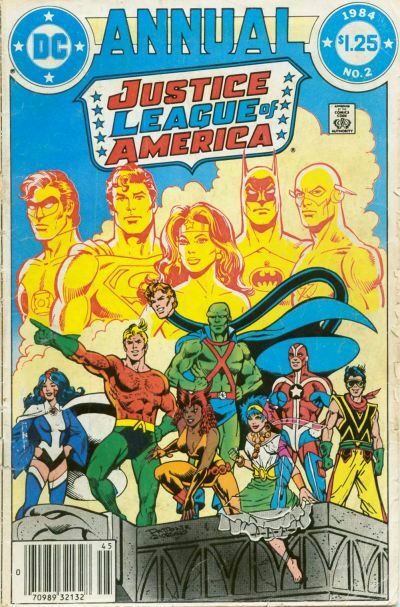 When I read the new first issues of Justice League of America and Justice League of America's Vibe from DC Comics, I have to say that I had low expectations. I have much of the run of the Justice League Detroit from the months in between J'onn J'onzz making his triumphant return to the Justice League to the lead-up to the Crisis on Infinite Earths that lead to the deaths of a good chunk of the Detroit-era League. I will say right now that I thought that the Detroit-era of the Justice League was a great idea. On paper. Unfortunately, that idea hit some speedbumps on the way to getting to the final stories. One of those major speedbumps was Vibe. To be honest, the portrayal of the character had all of the subtlety of being hit in the head with a bowling ball. One thing that DC Comics had a hard time recovering from, after Marvel Comic's surge of popularity in the 60s and 70s, was that all of their characters were pretty much white middle class guys (except of course for the billionaire white guys), and there wasn't much for readers of color to grab on to with DC's books. I'm sure that was part of the reason for a multicultural approach to this run of the Justice League. It just wasn't very good and to prove that it wasn't very good, the final story arc lead to the death of a couple of the new characters and the ending of this version of the Justice League. So, let's fast forward to 2013 (and ignore the "return" of the Detroit-era Justice League in Darkest Night) and we see a return of some of the ideas of that team to the New 52. There's a new multicultural Justice League in town, and it is set in Detroit again. 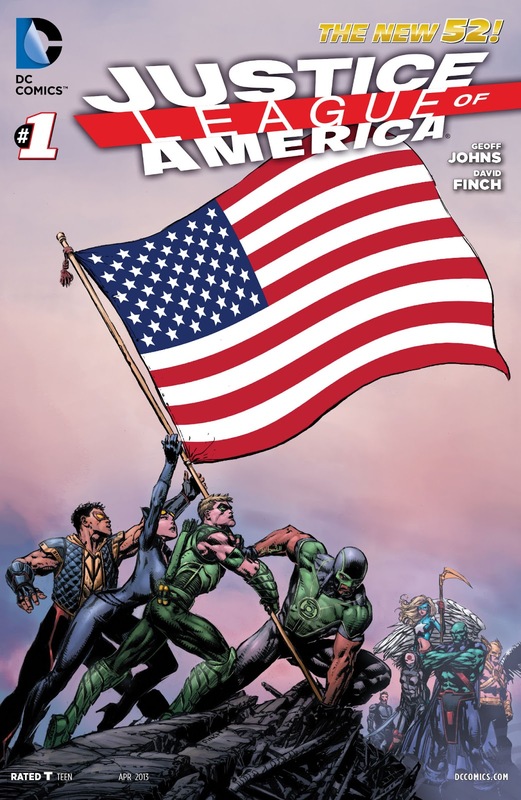 Michigan native Geoff Johns launches this new Justice League of America book (although he will be replaced by a permanent writer), probably in order to tie it more tightly into the next "Aquaman" of the New 52, the comic with the awkwardly long name of The Justice League of America's Vibe (hereafter known as Vibe). I'm sure that's to avoid "confusion" with the magazine of the same name, but who really knows. The set-up of Justice League of America #1 and Vibe #1 are both the same: Darkseid's attempted invasion of Earth from the initial story arc of John's and Jim Lee's Justice League comic. Detroit was the first beachhead of Darkseid's invasion, and also the place where the first person died: the brother of Francisco "Cisco" Ramon, the man who will become the super-hero Vibe. Cisco was caught in the first Boom Tube opened onto Earth, and was saved by his brothers Armando and Dante. 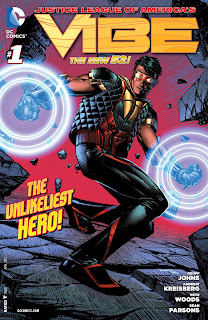 Armando was killed by a Parademon in the attempt, but did save his brother.Being caught in this Boom Tube is what has given Cisco his powers: the ability to sense beings from other dimensions (due to their differing vibrational rates) and a powerset of vibrational-oriented abilities. Both of these comics set up the background of the formation of this new Justice League, and Vibe becoming a super-hero. I think the whole "the unlikeliest hero" is a bit too cute and self-aware on the part of Johns and DC Comics. Yes, we get that no one liked Vibe from the first time around but there were reasons for that. These comics do a much better job this time around, and I'm not the only one who thinks that. Vibe is a much less stereotypical character this time around, and I think that is what will potentially keep this book going, not any marketing ploys. Another Detroit-era character, former mentor and support staff member James Gunn returns as a member of the secret government organization A.R.G.U.S. (no where near as cool or fun as S.H.A.D.E. but an attempt by the powers that be at DC Comics to make something like Marvel's S.H.I.E.L.D.) and mentor and support staff to the new Justice League of America. I'm not 100% sold on A.R.G.U.S. within the setting yet, it just seems too derivative even after a year. Throw in Steve Trevor as a super-spy and Suicide Squad/Team 7 member/leader Amanda Waller running the whole shebang and I'm still not entirely sold on the concept. Another thing that I didn't think that I would be saying, but Vibe definitely came out of the gate a lot stronger than Justice League of America, which makes sense since Vibe does have a much smaller cast to deal with. However, these are both good comics. I'm not the biggest fan of Geoff Johns. He is a good writer, don't get me wrong, but he can be very uneven in his storytelling. His work on Green Lantern tended towards being overly long, and sometimes convoluted, and his work on Justice League is no where near as strong as what he had done with the Justice Society in the past. That said, Johns brings an incredible amount of enthusiasm to any book that he writes. Love or hate his work, but this is a man who is motivated by love for characters. Unfortunately, as I said, that doesn't always promise quality but it can bring good things to any book that the man works on. Are these books worth buying? Yes. I would say that Vibe is definitely the "must have" book of the two. Johns has tied this new character deeply into the story of the New 52, and that means that there are going to be some big things happening in this book (as demonstrated by the reveal on the last page that I am not going to spoil), and they are going to be important to the advancement of the setting. 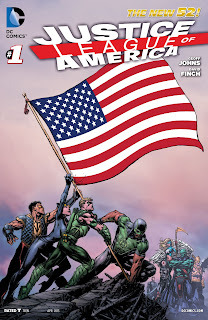 Justice League of America is still a wildcard for me. I know that this is also supposed to be important to the advancement of the overall setting, but I'm just not feeling it as much as I did with Vibe. Probably because there is so much going on, and so many characters to introduce that there wasn't as much of a chance for storytelling. The opinion in the comics blogosphere seems to be that Vibe will be the book that won't last, but comparing these two first issues I am going to say that it has much longer legs (so far) than Justice League of America. I'm not saying that I expect the book to be cancelled, I am just saying that of the two, Vibe was the stronger comic. You should buy both Justice League of America and Vibe, but you should buy the hell out of Vibe. IDW Publishing + Cartoon Network = Puzzling? 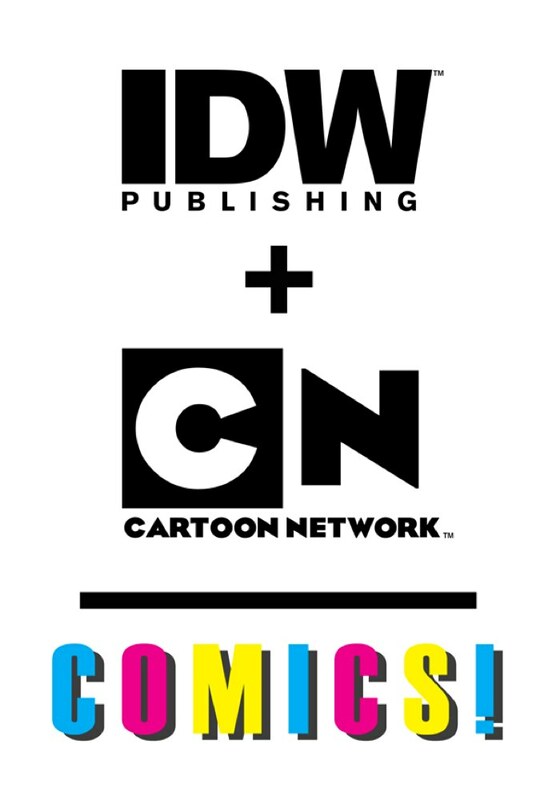 News broke today about IDW Publishing picking up a license to do comics based on Cartoon Network properties like Powerpuff Girls, Ben 10, Dexter's Laboratory Samurai Jack and other cartoon. I have to admit that while I think it is great that we are going to see more all ages comics (from some great cartoons) I am puzzled as to why Warner Entertainment and the Cartoon Network made the decision to farm this out to another company, rather than publish internally through DC Comics. When Warner Entertainment and DC Comics and other companies were reorganized a few years ago the stated reason was to foster better synergy within the various Warner Entertainment companies. This means seeing more DC Comics properties making it to the big and small screen (although DC and Warner have seen much greater success in the feature-length animation works rather than feature films), but it also mean taking advantage of the fact that Warner has a publishing arm in DC Comics that would handle adapting other properties into comic book form. Yes, we've seen a few Supernatural comics (The CW Network being owned in part by Warner), but outside of that we really haven't seen the synergy. All of this is what makes this announcement so...puzzling. Obviously, I am not tuned in to these things and I don't have any sort of inside track on what's happening, but it just seems odd that Warner would decide to do this with a company that isn't a part of their umbrella. Is this demonstrating a lack of faith from Warner in DC Comic's ability to handle doing all ages publishing? Between the three sephiroth of Kether, Chokhmah, and Binah is the Abyss. The Abyss is home to the displaced shards left over from the previous creation, these shards were once much more than the lingering, broken spirits that they are now. The previous creation was marked by Chaos and Silence, and now the things in the Abyss are what remains of all of that. These shards sometimes irrupt into worlds, as they drift around through the cosmos; moving amongst the sephiroth and floating about through the various pieces of the tree of life. When these shards move into world they become great beasts of destruction, driven to undo the current creation and restore the one in which they had been whole. Sometimes these creatures go unchecked and they raze world, drawing them into the anti-creation of the Abyss and bringing them closer to Tohu and Bohu. Sometimes champions rise up and fight these creatures, struggling to save their worlds from death and darkness and silence. I will (hopefully) be doing a series of Alphabet posts that tie in some of the background ideas that I am putting together for my Demon Hunters game. This is going to be a dark fantasy game, and it will be playtested by the G+ Hangout gaming group that I am a part of so you will be able to watch the game as it develops. MWP To Develop All-New Series of Pick-Up-And-Play Games set in the ‘Verse. WILLIAMS BAY, WI, February 22, 2013 – Margaret Weis Productions is thrilled to announce a partnership with Twentieth Century Fox Consumer Products to publish tabletop role-playing products based on Joss Whedon’s fan-favorite television series, Firefly. Initial releases are expected as early as spring of 2013 with print and digital releases based on MWP’s award-winning Cortex system. The adventures of Captain Malcolm Reynolds and the crew of Serenity continue to attract new fans a decade after the television series first aired. Fresh from recent success, MWP’s own crew of seasoned designers and creators of licensed role-playing games, stand ready to develop an all-new series of pick-up-and-play games and game supplements. Based on much-loved characters, stories, and locations, every Firefly RPG product will be designed to be accessible, authentic, and as innovative as fans have come to expect from MWP. "This project is a dream come true for me. I have been such a long-time fan of Firefly!" says MWP President Margaret Weis. "I look forward to working with my crew to take us all back out into the Black!" Margaret Weis Productions (MWP) is an award-winning publisher of tabletop roleplaying games. Their most recent successful licensed games include those derived from the worlds of Marvel, Dragonlance, Leverage, Smallville and Supernatural. Based in Wisconsin, MWP has been bringing games to fans since 2005. Leading MWP is New York Times Bestselling author Margaret Weis. She’s a tireless supporter of fandom and gamers with a vision for her company to bring high-quality games to both long-time gamers and newcomers alike. IDW Publishing And The G.I. Joe "Relaunch"
Periodically, although some may not agree with me on this, you really have to freshen up and revitalize the G.I. Joe concept. This is, after all, what got us the 80s G.I. Joe cartoons and comics that so many are still nostalgic for today. IDW Publishing, with this new G.I. Joe #1 is doing this again, and revitalizing the concept again for the 21st century. In the book, the team is coming out of the shadows to become a public face for the American military, or as Duke puts it in the issue, so-called "celebrity soldiers." As a gamer, I have to say that this concept sells me on the book. As a matter of fact, this concept is ready made for a role-playing game setting (I wish that Hasbro would let Wizards of the Coast do a G.I. Joe role-playing game, but that is a digression). One of my favorite lines from the comic comes from Shipwreck: "Do I have to wear this? I'm a Navy SEAL, not a cartoon duck." For the first time, the G.I, Joe team has to deal with marketing: tee shirts and even toys with their likenesses. This is not a restart, or a relaunch or a revamp. The previous continuity all still seems to have taken place, right down to General Colton, the G.I. Joe of the original "Adventure Team," being put in charge of the contemporary team. These are all of the characters that you know and love, they are just changing and adapting to the world around them, a world where news and advertising are as much weapons as guns and knives. In addition to the usual, familiar faces, there are a couple of new characters. In accordance with the team's new public mission there is an embedded blogger (named Hashtag by someone who has obviously been on the internet during the last few years) who's job it is to record the team's missions and make sure that everyone knows who they are and what they do. I also like the fact that Cover Girl had been on Project Runway. The story is pretty fast paced. We are dropped into the action, after things have already hit the fan and then brought up to speed with flashbacks to the G.I. Joe press conference and the events leading up to the current mission going wrong. There are a lot of familiar notes to this story and writer Fred Van Lente is obviously very well-versed in the lore of the Joes. However, this is not a continuity mired comic. You don't have to have read ten or twenty years worth of G.I. Joe comics in order to know who the people are, or what is happening. With a new G.I. Joe movie looming on the horizon, that is probably a big reason for all of this, and I do not think that it is a bad reason either. Unfortunately comics have become wrapped up in a certain kind of fan who knows the trivia and minutia of thirty or more years of continuity and by creating comics that appeal to those people the casual and new readers have been locked out of comics. I applaud IDW Publishing for making a comic that is so new user friendly. The art is really good as well. I mean really good. 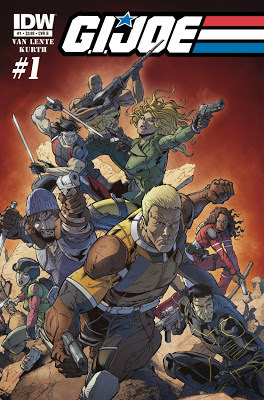 With Steve Kurth on pencils and Allen Martinez on inks, the book has a team that is capable of dynamic, engrossing art that is both good in the action scenes as well as the character bits. The art lives and breathes and draws you along with the story. Is this comic worth buying? Hell. Yes. This is the best G.I. Joe first issue that I have seen in a very long time, better than previous issues from IDW. I would say that this is probably the best first issue that I have seen since Devil's Due had the rights and was publishing a G.I. Joe comic through Image Comics. Even if you're not a fan of the Joes, if you like military stories or action-oriented comics, I really think that you will like this book. It has made me impatient for the next issue. If you didn't pick this book up today, get back to your comic store and get a copy before it is gone and you have to wait for the trade to find out what all of the rest of us are excited about. 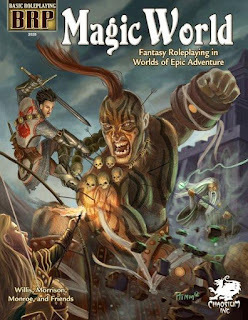 The Magic World PDF Is Live! Another announcement of a "book" going on sale. This time it is the Magic World PDF from Chaosium. Yeah, that price is a bit wow. I don't set the prices, I just report them. Hopefully that's just a typo or something. I've seen the early stuff and +Ben Monroe has done a really good job with getting this new book together and spiffing up the old Elric and Runequest material for this. The physical book is supposed to be ready in March, from what I am told. I do love that cover, however, and this is BRP Fantasy Role-Playing at its finest. Do you like eBooks? Sure, we all do. Do you like eBooks of fiction from gaming-related people? Now I bet that I have your interest. This is a "pay what you can" bundle, with a minimum of $1. The monies raised will be split among the authors with donations being made to the Child's Play and Reading is Fundamental charities as well. This bundle is only available for another 18 days, so get it while you can. I know that it isn't a favorite of everyone, but I liked the book and thought it had some cool bits to it. 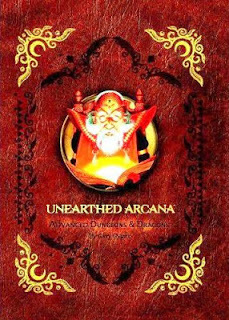 Starting today, D&D fans can check out the latest Advanced Dungeons & Dragons 1st Edition reprint: Unearthed Arcana! 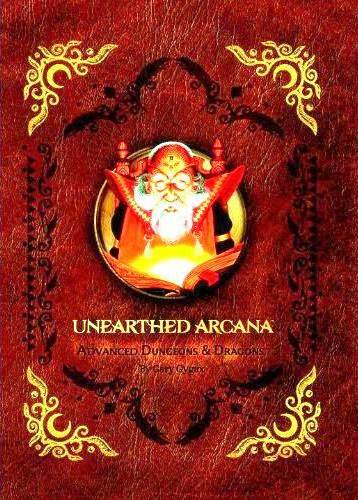 The original 1985 release of Unearthed Arcana changed Dungeons & Dragons forever by introducing new races, classes, magical items, and rules written by Gary Gygax. This new printing will appeal to nostalgic D&D fans looking to add this classic to their collections, which has been faithfully reproduced in a new premium edition with gilded pages. The cover design mirrors that of the premium reprints of the 1st Edition Player's Handbook, Dungeon Masters Guide, and Monster Manual, and this reprint includes errata originally published in Dragon magazine. Every Dungeon Master who has created a campaign milieu out of whole cloth, so to speak, can certainly understand that the more one learns, the more one comes to understand how little he knows. So too the multiverse of this game system. The farther afield one goes in exploration and discovery, the greater the realization of how vast is the realm of unknown knowledge which awaits discovery, as it were. However, such as with our actual world, the expanses of the game multiverse will always have frontiers and unexplored territories. This fact, indeed, is what makes the AD&D game system so wonderful and appealing. I studied journalism through high school and college. I worked on the various papers of the schools that I went to, and as a blogger I have tried to utilize the skills and training that I picked up while studying journalism. When I was in high school, still living in Indiana, my mom manager to wrangle my getting to interview (then) local morning radio personalities Bob & Tom. It was a big thrill, but I think being a full of himself teen took the edge of of the awe that I felt in talking with them. Yes, there is a point to this. A couple of weeks ago I was able to interview +Monte Cook for my Dorkland! Roundtable. I think for the first time since I have been interviewing people, I was nervous during my interview. I tried to work around it. Who knows, hopefully (if I wasn't telling all of you about it now) it won't be noticeable. Monte Cook was one of the designers of D&D 3e, the game that brought me back into the D&D gaming fold after so many years of wandering in the role-playing deserts of the world. Monte also was given the opportunity to not only revamp the World of Darkness, but he was able to convert it into a different gaming system. Of course, we talked about all of that. Monte also had a big Kickstarter for a game that he is working on now, a science fantasy game called Numenera. I didn't back the Kickstarter, but I am looking forward to when the game comes out. One of my big regrets of my many years of not playing D&D is that I missed out on Planescape, one of the big second edition settings. Honestly, from what little I do know about it I think that I would have really enjoyed playing in the setting. That's also probably why Planescape, despite being one of the things that Monte has worked on over his career, gets so little mention in our interview. Maybe one day I will find the books for cheap and I will get to see what was such a big deal about the game. Until then, I guess that I just have my imagination. I hope that you all enjoy the interview. I spoke with +E. Bryan Rumph on the Dorkland! Roundtable. A new designer with a rules light Noir game called The Coin's Hard Edge. Like a lot of starting publishers in this technological world, he is using the Print on Demand services of Lulu.com to fulfill the printing on his game. I honestly think that this is a smart decision for someone starting out (the first print run of Spirit of the Century was done via PoD after all). We talked a bit about what it is like to be a publisher and designer starting out in gaming right now. It was a good talk and if you are looking at starting out as an RPG publisher, or have just been thinking about it, Bryan makes some good points in his answers. What's that? Not enough classes in your old school game, or you just want something weird and different? Check out the custom class generator page. Members of this class must have at least 13 in one or the other prime requisite to get the 5% bonus to experience. If both prime requisites are at least 13, members of this class will gain a 10% bonus to experience. Members of this class may wear leather armour and carry a shield. Members of this class may only use swords. Members of this class roll to attack as a magic-user. Members of this class may not use any magic items. Members of this class can attempt to turn the undead as if they were a cleric of their level. Members of this class save as a fighter of their level. As yet, I have no name or background for this class, but I definitely want one. You have a suggestion, put it in the comments here or over on G+. 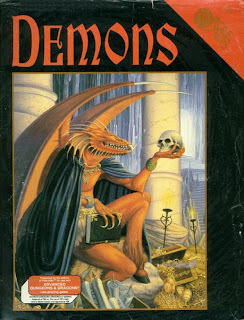 I don't think that I've ever made a secret out of the fact that Demons from Mayfair's Role-Aids line (and the rest of the Demons series as well) is some of my favorite gaming material out there. The Demons series comes from that sad period where TSR was downplaying the infernal in their D&D materials because of the whole Satanic scare gripping the hobby. So, of course, semi-official third party publishers would pick up the ball and run with it. The Role-AIds line was a series of supplements, modules and even campaign settings writing with the AD&D rules in mind My box says "Presented by the editors of Role Aids for use with Advanced Dungeons & Dragons role-playing game." Some of the early Role-Aids stuff was officially licenses, but apparently that relationship had ended by the time that this line of supplements came out. I've used swipes from the Demons stuff in my online Swords & Wizardry game. There is a lot of interesting material in this boxed set (and all of the others as well): demonic monsters, delightfully twisted new spells (admittedly a lot of which have to do with summoning and unleashing the nasty new creatures to be found in this material) there is even a new class and a new race. They are even nice enough to describe a cosmology into which these new revelations fit (as well as future ones in the other supplements). All of this in about 100 pages, or so. Succinct. The material in Demons is courtesy the imagination of Mike Nystul. Yes, the Mike Nystul who has a D&D spell named after his real name rather than a character. Also, the same guy who created Whispering Vault and did a bunch of stuff for Mayfair's other game lines, and worked on Shadowrun as well. That gives Demons quite a pedigree. If you hunt around eBay or places like Noble Knights or Troll and Toad, you can find copies of stuff from the Demons line for fairly decent prices. I do need to track down a copy of the Apocalypse boxed set, I think that is the last thing that I need for this line (one of the very few game lines that I am kind of completionist about). I think that Demons is ripe for someone to make an "homage" to the material. I would probably do it myself if I had a good enough of an artist that I could afford to pay out of pocket. There's nothing more old school than having a bunch of demons and demon hunters to stomp all over them. Just writing about it makes me want to run that sort of campaign. Needless to say, I really enjoy these supplements and think that you should check them out as well, if you haven't already. There is some really cool stuff that can perk up your campaigns to be found in all of these books. Not too many random tables, but a pack of interesting monsters, spells and a demon slaying class can be found for you in this box. Not to mention a new look at a universe that you've been gaming in, but that still has some new secrets for you. Oh, and a slight disclosure. When I was still with Seraphim Guard I did spearhead an attempt to purchase the rights to the Role-Aid line from Mayfair Games. I thought the original material would be of use to people still gaming with the old systems, while at the same time brand new material could be spun out of all of these great books for people and their games now. Sadly, it turned out that Mayfair no longer had the rights to this line. Apparently in their legal battle with TSR over the copyright/trademark issues over the Role-Aids line, the rights had been transferred to TSR. That means, someplace in a WotC archive all of these lovely Role-AIds supplements are mouldering away.